Well after having a real hard time finding a SIMPLE example for casting light shafts I finally managed to port the Volumetric Lighting Tutorial by Nicolas Menzel to monogame. Surely there are lots of examples, but mostly in XNA4 or too complicated for me as a beginner. The source by Nicolas isn't that simple, too, as there's lot of unused stuff - but I finally got it running! So I put the project to gitHub and want to give a quick description, hoping that it may help others desperate like me finding a simple solution. The original consisted of 2 projects I merged into one. I also added a controls-form for easily manipulating the light shaft parameters. The exposure and weight factors are simply scale factors. Increasing either of these increases the overall brightness of the result. -LightShaftDecay - dissipates each sample's contribution as the ray progresses away from the light source. This exponential decay factor practically allows each light shaft to fall off smoothly away from the light source. -LightShaftDensity - control over the separation between samples. If we increase the density factor, we decrease the separation between samples, resulting in brighter light shafts covering a shorter range. The control-form "controls" contains some sliders for manipulating the lightshaft effect parameters. The important thing here is to pass a reference to the main game class with 'this'. With this reference You then are able to access the parameters from the control class. Another important thing is to set the graphics feature level to "HiDef". SharpDX.SharpDXException: "HRESULT: [0x80070057], Module: [General], ApiCode: [E_INVALIDARG/Invalid Arguments], Message: Falscher Parameter. Maybe one could reduce the number of them to two or three, but I think it provides more clarity to have one RT for each step. 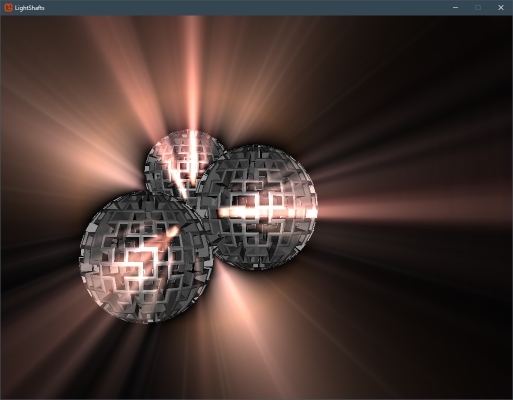 LinearFilter.fx - I'm not really sure if it's necessary to apply this shader like it has been done here… It seems to me to be some kind of simple "blurring" shader. It could be that one could achieve the same result with the integrated sampler states…? So far, for this moment… hope to add some more details next time! - added the option to set the scale of the lightshaft sampling texture - this shows the differences when downscaling the sample texture and applying the effect to different sizes. - Changed NUM_SAMPLES parameter in LightShafts.fx to input variable. This lets You test different samplerates. In order to get this working I had to change the shader profile to 5.0. Also I had to add an unroll to the for-loop parameter….At moment it is set to 400 for testing - there's one anoying drawback: it takes quite long to compile. You can change the unroll value to e.g. 100 -> [unroll (100)] if it takes toooo long to compile - but don't forget that this also changes the maximum of samples. 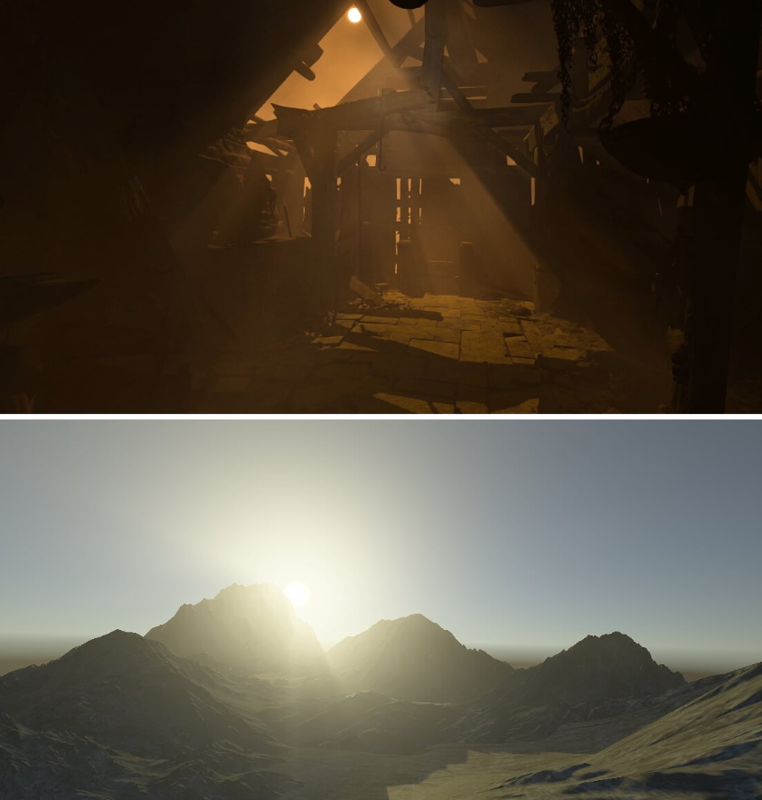 what is the different with the real volumetric lighting? Well, there're different approaches to simulate this effect. The approach, that is used here, is quite good explained in the GPUGem article mentioned above. Edit: one thing just came to my mind - this here is somehow a "flat" sampling technique. Other approaches use a volume and sample slices along the view-light vector. With "Real Volumetric" lighting, the effect is still visible when the sun is in your back. But it requires more work on the GPU (Raymarching, or Conetracing, etc) not viable without computeshaders if you want to have the fastest framerate. I've been passively experimenting with this "real" volumetric lighting. I haven't tried it with geometry/compute shaders yet, but it can be doable without (although it's a bit of a pain and requires a good amount of precomputation). Side note: Breath Of The Wild is what got me pondering over this; I noticed that the rays appear regardless of facing direction.